The Samsung Galaxy W makes use of the standard TouchWiz music player. Samsung has enabled equalizer presets (including a custom one) along with the sound-enhancing DNSe technology and 5.1 channel virtualization. The nice feature that allows you to quickly look up a song on YouTube or via Google search is also here. The handset also prompts you to select whether to look up the artist, the song title or the album. Hubs are not just for Windows Phone 7 – Samsung, at least, seems to think so. They’ve come up with separate multimedia hubs as a way to get fresh content for your phone. 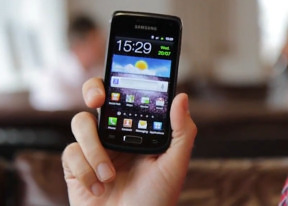 On the Galaxy S II there is a total of four of those and three of them have made it to the Galaxy W as well – the Social hub, the Music hub, and the Game hub. The Social hub combines your email accounts with social networking (Facebook, Twitter, MySpace, LinkedIn) and IM accounts (Gtalk, MSN and Yahoo! Messenger) and shows all incoming messages as one list with handy shortcuts to reply, mark as favorite and so on. There’s filtering by message source too, to help manage the inflow of incoming updates. The Music Hub lets you browse music online (with search tools, charts, lists of new releases and so on). You can preview songs (30 seconds each) and buy individual tracks or whole albums. Finally, there’s the Game Hub, which will quickly become your go to place for finding new games. The titles are separated into Social and Premium games and there’s a news section too. There’s a try-before-you-buy option, so you can check out a game before committing your cash. The nice thing about that Hub is it includes the titles published by Gameloft, which are otherwise not available on the Android Market. The Samsung Galaxy W I8150 is a Galaxy S (Plus) inside, but a completely different device outside. The change of screen tech is the key thing to note. No SuperAMOLED is bad news aesthetically, but should be easier on your budget. The styling is easily recognizable, a thing that you'll appreciate if you've had enough of the original I9000 Galaxy S forms. So, although there's nothing we haven't seen before, Samsung have raised the Galaxy W's chances by giving it personality of its own. There's a bit of the Galaxy Ace S5830 in it and some of the Galaxy S Plus. We guess the Galaxy W will cross paths with these two more often than not. For all we know, the Galaxy W may be a regional edition, just like the Russia-bound Galaxy S Plus or a minor upgrade for the Ace. It seems no number of phones will be enough for Samsung in the midrange. Some of them may look too similar but they may never compete on the same market. And phones like the Galaxy W will probably enjoy robust demand by both end users and carriers.